If you are new to graphics programming, you might expect that a bitmap would be arranged in memory so that the top row of the image appeared at the start of the buffer, followed by the next row, and so forth. However, this is not necessarily the case. In Windows, device-independent bitmaps (DIBs) can be placed in memory in two different orientations, bottom-up and top-down. 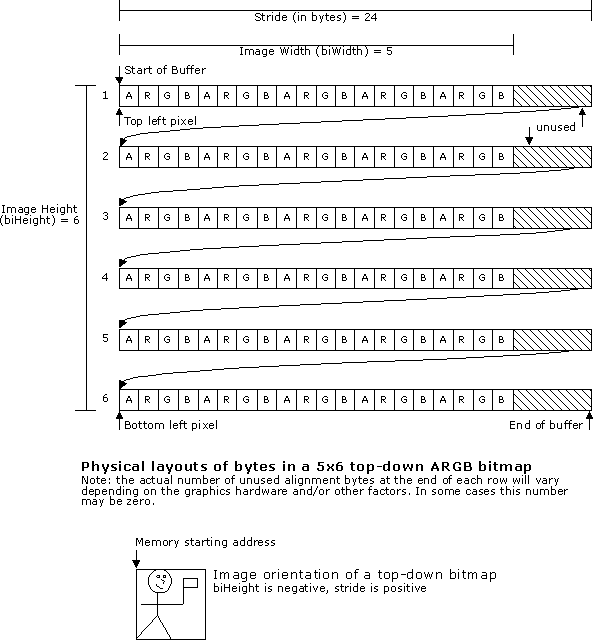 In a bottom-up DIB, the image buffer starts with the bottom row of pixels, followed by the next row up, and so forth. The top row of the image is the last row in the buffer. Therefore, the first byte in memory is the bottom-left pixel of the image. In GDI, all DIBs are bottom-up. The following diagram shows the physical layout of a bottom-up DIB. For RGB DIBs, the image orientation is indicated by the biHeight member of the BITMAPINFOHEADER structure. If biHeight is positive, the image is bottom-up. If biHeight is negative, the image is top-down. DIBs in YUV formats are always top-down, and the sign of the biHeight member is ignored. Decoders should offer YUV formats with positive biHeight, but they should also accept YUV formats with negative biHeight and ignore the sign. Also, any DIB type that uses a FOURCC in the biCompression member, should express its biHeight as a positive number no matter what its orientation is, since the FOURCC itself identifies a compression scheme whose image orientation should be understood by any compatible filter.